Believe it or not, Freshwater Stingray is not at all an invertebrate just like everyone thought it was and in fact, it is a fish. The river species is considered one of the largest aquarium specimens to exist in the world and anyone who has the intention to keep it as pets in home fish tank should seriously think about how to accommodate them when they grow to become large enough. Unlike their saltwater cousin which lives in the ocean, the freshwater type has a rounder overall shape and depending on species some can have spotted or polka dotted pattern marking appearing on the top. Freshwater stingray is commonly found in the rivers of Thailand and Cambodia, areas around Malay Archipelago in Borneo, the Amazon River and until today, native species can still be found to survive in wild natural habitats although their numbers have since dwindled up to the extent of extinction. Attempts to keep and breed the fish in captivity has so far produced desirable results and normally if you visit public aquariums, chances that you might always come across a river stingray among the exhibit display. A quick glance will tell you that most of them grow up to very large with some measuring almost in meter in their disk size and the tank easily measure anywhere more than 500 gallons minimum in capacity. There are some notable species however worth considering especially those smaller freshwater specimens which some hobbyist can have the chance to keep in home aquariums. One of them is the Tea Cup stingray and the other is the Motoro stingray. Both of them although classified as being small type specimen but the idea of seeing at 2-feet giant fish swimming in the tank doesn’t sound like anything close to being small at all! The fish has a very hearty appetite meaning that if you constantly provide live fresh foods, they will do their best to finish everything up. Being a natural predator, the freshwater species love marine shrimps, mollusks like clams and they will also go on a feeding frenzy upon seeing small-sized market fish dropped into the water. With proper diet and nutrition coupled with strict feeding schedule, you will find that they can grow very fast adding at least 1 - 2 inches in just a month and by the time they get to about one year old, the size is almost close to their adult giant size. 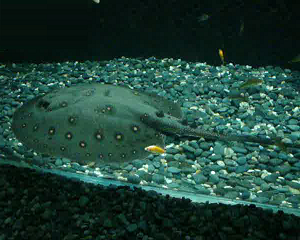 The tea cup freshwater stingray can be mixed into a community aquarium comprising of similar species grouped in the same biotope such as discus and freshwater angelfish. Try not to mix other fierce predatory tank mates such as oscar and arowana because that will introduce unnecessary stress in the aquarium and you will further deplete natural resource like oxygen and valuable tank space. Forget about owning a stingray as pet if you do not have aquarium size with the capacity of at least 200 gallons and the fact is that with their fast growing rate, nothing is ever enough for them. Recommendation from experts is that you should provide at least 500-gallon tank or else this will make it difficult for yourself and also your fish. Keeping them in a confined tank is indeed a challenge. Always monitor the water quality and any extreme jump in nitrite and nitrate levels can be harmful and life threatening. Some freshwater stingray is a brackish type and thus adding some salt to make up to the certain salinity is always desirable (Check out the recommendations on brackish water setup for more information on this). Handling the fish is also another area that you should be concerned of. Untrained handlers who try to catch them can sometimes ended up getting injured and the spine can pieced through the flesh and cause deep wounds and cuts and sometimes serious injuries will result because those spines are venomous as well. My advice for those new to this hobby, is to find out as much information as they can and if possible seek out ways that will allow them to learn about hands-on experience from the other fellow hobbyist who can show the proper ways to handle the fish. This is especially important when it comes to cleaning the tank and also lastly what are the pitfalls to avoid.